​"Boogie on the Bayou 5K"
This trail run/walk is open to all ages and abilities! Don't be intimidated, this family friendly event is sure to be a blast! Make plans to stay after the race for the other festivities at Fall Celebration including a great lunch! Note: This is not a timed race. However, the first 5 adults will receive recognition! Payment with registration is simple and open now. If you do not pre-register by the deadline, you may still participate. We will have a limited number of extra materials available for the day of the event. Be sure to arrive by 8:30AM to process your registration! All funds collected will go towards the educational outreach projects at Black Bayou! You will receive an event T-shirt, race bling and a small gift bag with each registration with water and recovery snack. Race day registration is possible, but shirt and gift bag availability is not guaranteed. Trail run begins and ends at the parking lot of the boat launch. (See trail map below) The trail is a wide, mowed grass path that follows the lake edge and circles the bird blind pond before returning. This habitat is diverse and the scenery changes, but the path may have uneven areas. Please keep an eye out as you run. Participants under the age of 12 must have a parent accompany them at all times during the 5K Run. Registration is simply online through the registration page with payment. If you have any problems, email us and we can help you! 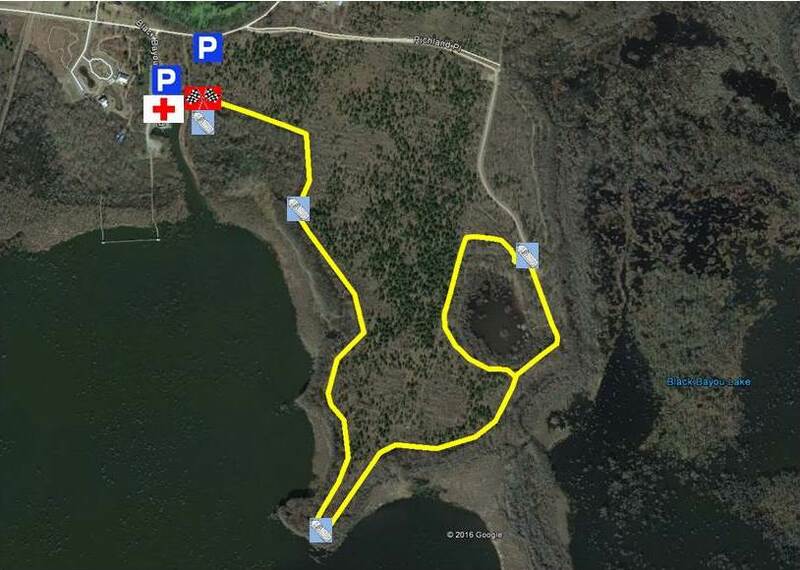 Participants can pick up their T-shirts at 8:30AM on the morning of the run at the Trailhead (marked on map above). T-Shirt sizes are limited to adult S-XL. Youth registrants, please use the same registration form as adults. In the very unlikely event the weather does not cooperate or if the 5K run is cancelled for any reason after you have paid your entrance fee, you will still receive your T-shirt and race materials! Should this happen we will contact you by email and post the information both on Facebook and this webpage with any additional details or rescheduled event date.